When the materials are selected from the WinTXS™ Materials Database, default setpoints for extruder barrel temperatures are downloaded along with the material properties; each barrel temperature setpoint can be modified on the Operating Conditions screen. 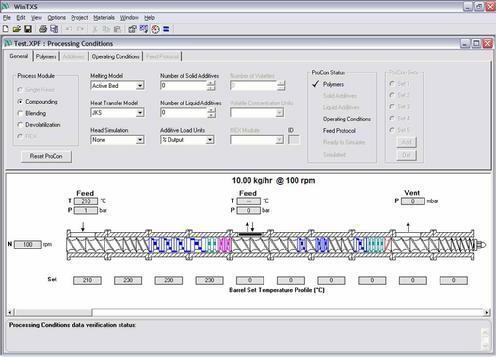 Screw speed, throughput, feed temperature are specified for each simulation run. WinTXS™ can compute the pressure drop through a specified die/breaker plate/screenpack or you can specify the extruder discharge pressure as a process variable. An Options screen can be opened to simulate using an alternate heat transfer model, simulate screen fouling and even simulate screw wear for each simulation run. WinTXS™ features "debugging" coefficients which are used to adjust the model to correlate with experimental data. Use the slideshow controls to navigate through WinTXS™ Operating Conditions screen displays.